Tourists tend to steer clear of the Caribbean during hurricane season, with good reason. So it was with some trepidation that I agreed to go on a sailing trip around Grenada and the Grenadines in September 2004. ‘Grenada hasn’t been hit by a hurricane for more than 50 years-you’ll be fine,’ reassured a friend. The reality was, of course, rather different. On arrival in Grenada, we were given a 36-hour window before the eye of Hurricane Ivan was due to pass through the very marina where our boat was moored. We sailed immediately for Trinidad. Hours later, the hurricane caused catastrophic damage to the island: more than 85% of it was devastated. Fast-forward through six years of slow recovery and a world recession, and the mood today on Grenada is decidedly upbeat. The agricultural industry has recovered, and the all-important airlift to the island is improving. ‘It’s an incredibly varied island: beautiful beaches on the south and lovely in the north, and the interior is like the Caribbean used to be,’ explains David Vaughan of Savills. ‘The capital is so English-it reminds me of a small Cotswolds town. The people are friendly and the infrastructure is excellent, so when the market picks up, it’ll be an amazing place to buy.’ The British entrepreneur and developer Peter de Savary has been responsible for keeping some of the momentum for development on the island going over the past few years. In 2006, he sold the newly built super-yacht marina at Port Louis, dubbed the ‘Portofino of the Caribbean’, and is now developing a maritime village around it with hotels, restaurants and apartments and villas priced from £350,000. His second project is the boutique beach resort of Mount Cinnamon at Grande Anse beach, one of the best on the island, where villas start from about £1 million. ‘We’ve sold two big houses recently to British buyers, one on each site, and are feeling optimistic about what 2011 might bring,’ explains Mark Scott, head of sales at de Savary (00 1 473 405 5800). ‘Grenada is slightly off the beaten track for people, so we know we’re going to appeal to more adventurous buyers.’ Meanwhile, for those looking for something more historic, old plantation houses do come on the market from time to time. Aylesford International is currently marketing the Mount Edgecombe estate, a 28-acre working plantation and six-bedroom house for $2.75 million (020-7349 5100). The island of Bequia (pronounced ‘Beckwee’), which forms part of the Grenadines, has hitherto been known principally to yachtsmen. Often dubbed the ‘new old Mustique’, this tiny speck of land just seven miles long is how the West Indies must have been before the blights of mass tourism. ‘Only, it’s better than that,’ explains Lara Cowan, who lived on the island and now runs Grenadine Escape (www.grenadine-escape.com). ‘It has all the charm of the Caribbean as it once was, and yet, because it caters for the yachting market, the service standard is first class.’ Key to its preservation has been its relative inaccessibility: most people travel to Barbados and catch an onward flight (landing is described as ‘an experience to sharpen the senses’ by one local), although an international airport is being built in St Vincent, a one-hour ferry ride from Bequia. Despite this, when foreigners were given the opportunity to buy land five years ago, parcels sold quickly. One of these plots is now home to Hope Bay, an extravagant home made up of a main house and six cottages built by the British developer Harry Marriott. Standing just three steps from one of the most beautiful beaches in the Grenadines, each cottage has a bedroom suite, and the entertaining is done in the main house. 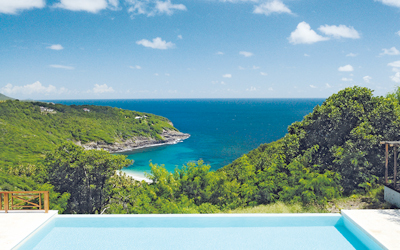 It’s the biggest house to be built and launched on the market in Bequia, and the price tag, although steep at $10 million, still represents a fraction of the value of an equivalent house on Mustique. Hope Bay is for sale through Savills (020-7016 3740) and Knight Frank (020-7629 8171).